This beautifully framed mirror attaches to the back of the dresser. The Gabriella Collection brings elegance to a cottage style bedroom. 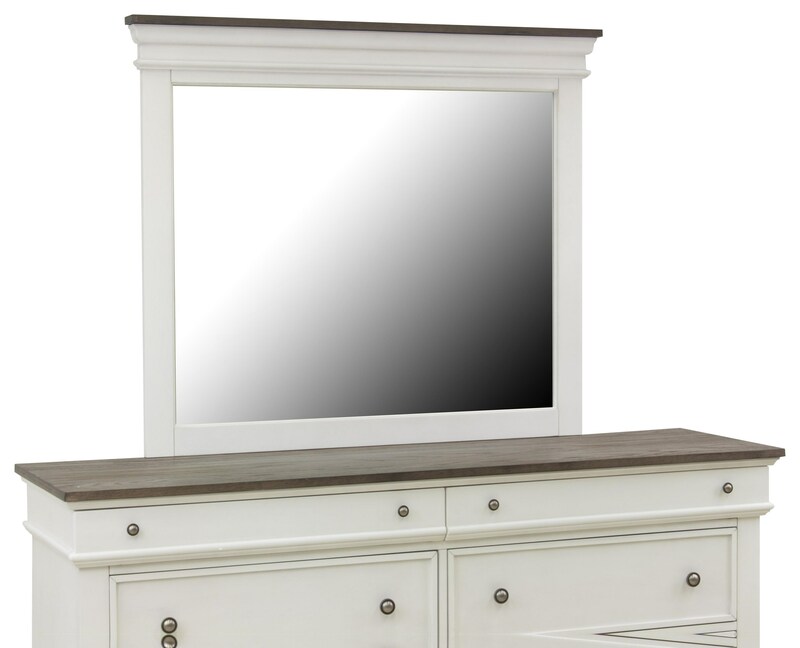 The 8 drawer dresser with mirror features antiqued drawer pulls, bun style feet and a whitewashed finish with natural wood accents The Gabriella Dresser with Mirror by Standard Furniture offers plenty of storage and will bring the perfect touch of cottage to your room. The Gabriella Dresser Mirror at Ruby Gordon Home in the Rochester, Henrietta, Greece, Monroe County, New York area. Product availability may vary. Contact us for the most current availability on this product. The Gabriella Bedroom Collection from Standard Furniture brings elegance to a cottage style master bedroom or guest room. The Gabriella collection combines comfort and beauty with a popular white wash finish which is accented with natural wood. The panel style bed features nailhead trimmed upholstered inserts on the headboard and footboard. Antiqued hardware and natural wood tops are featured on the nightstand and dresser with mirror. The Gabriella Bedroom Collection price includes queen headboard, footboard, rails, dresser with mirror and 1 nightstand. The Gabriella collection is a great option if you are looking for furniture in the Rochester, Henrietta, Greece, Monroe County, New York area. Browse other items in the Gabriella collection from Ruby Gordon Home in the Rochester, Henrietta, Greece, Monroe County, New York area.